I suggest you try transcendental meditation through which all things are possible. A letter autographed by John Lennon is to feature among the highest-selling items in an upcoming online sale, which closes September 25. 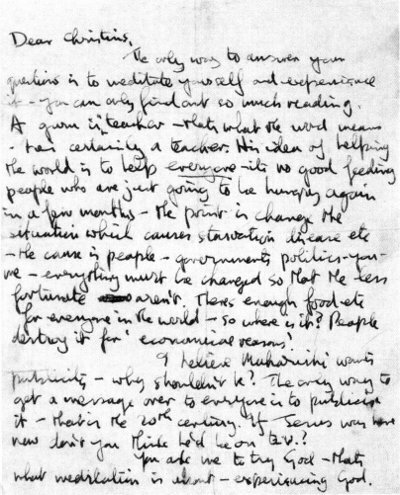 The letter provides an overview of the state of mind of John Lennon during his trip to India in 1968. Written on headed paper from the Spiritual Regeneration Movement Foundation of India, the letter provides a fascinating insight into one of the most transitional eras of The Beatles' history. It was during this period that they wrote over 30 of their most experimental songs, many of which featured on the White Album and Abbey Road. It is currently selling with a minimum bid of $1,000. PFC Auctions has a brilliant selection of memorabilia from the Cavern Club, which saw most of the earliest gigs in the Beatles' career. Highlighting the collection is an original Reslo ribbon microphone which was used by many of the bands that played there throughout the 1960s and therefore, almost certainly the Fab Four. Other unpublished letters of John Lennon are appearing, you can read it here.